The Indricotherium calf was only the size of a small adult rhino today and it is estimated that the calves were weened off their mothers milk after about a year. Like the modern rhino the Indricotherium most likely lived alone with the exception of mothers and their young. 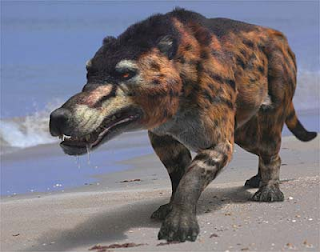 Andrewsarchus (An-drew-sar-cus) was a large carnivorous cloven-hoofed (even-towed ungulate) predator. 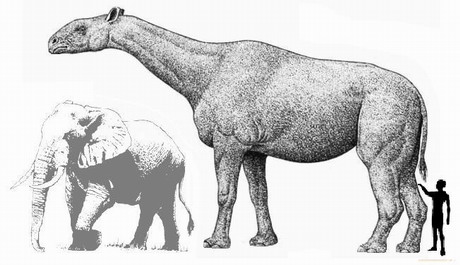 Little is known about Andrewsarchus, manly because it is only known from the upper part of the skull and some other fragments. 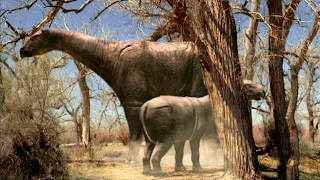 It is believed that Andrewsarchus was a predator and scavenger (a little like the modern hyena) and most likely ate sea turtles, selfish, beached whales, (plants may have been included), and possibly stillborn brontotherium (bron-tow-fear-e-um) calves. 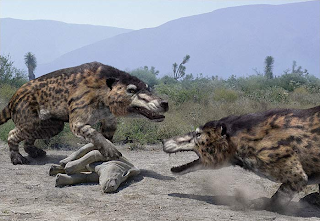 Andrewsarchus was the largest mammalian predator to ever live (Twice the size of the polar bear). Andrewsarchus is known to be "a sheep in wolfs clothing" due to the fact that it's closest living relatives are sheep, goats, pigs, whales, and other cloven hooved animals.